Please introduce yourself. Where were you born and raised? I was born in Portland, Oregon but raised in Hillsboro, a suburb of Portland where I still live today. It was not until I left the Portland area for college that I heard from people about how white Portland is. My parents intentionally chose Hillsboro as a place to raise their children because it has a larger Vietnamese community and they wanted us to have some sort of connection to our culture. That said, I was surprised when I returned from college and realized how truly white Portland is. I am very thankful that my parents were deliberate in where they chose to raise a family. How did you hear about this project? What encouraged you to participate? One of the PYD co-founders, Julia, contacted me after I had tweeted about The Sympathizer. I was really moved by Viet Thanh Nguyen’s book and was also excited by the book’s reception. Growing up, I felt like my voice was invisible and irrelevant so it is encouraging to see more Vietnamese voices receiving the recognition and respect that they deserve. How did your parents escape Vietnam? Did your parents ever talk to you about their experiences? My parents are both Vietnamese immigrants and they have shared a lot about their experiences to ingrain a deep sense of resilience in my sister and I, starting from a very young age. They were intentional in sharing their hardships because they wanted us to be grateful for the opportunity we were provided but also to be proud of where we came from. I did not truly understand the second part until a lot later, because as a young kid, I thought my parents just wanted to guilt me into achieving more. Looking back, I feel so naïve because my parents just wanted me to appreciate their sacrifices and to demonstrate that anything is possible. Now, I am overwhelmed with pride when I think about what my parents have experienced in order to not just make it to the United States, but also to thrive and flourish in it. My mom is the ninth of eleven children but she was one of four siblings who was sponsored to the United States. Unlike my dad, she left behind a lot, including her community, friends, siblings, and parents, because she ultimately wanted the “American Dream” for her family. However, I can tell that my mom is oftentimes consumed with envisioning “what if” scenarios of what life would have been like if she didn’t leave. I think it’s especially hard for her because over time, she has faced the harsh reality that the “American Dream” is a myth. I think my mom is proud of the life that she’s provided herself and our family, but she is frustrated by all the obstacles that she’s had to overcome in order to do so. She has had to work tirelessly doing tough manual labor for little pay, face language barriers, and put up with overt racism and discrimination. I think she also feels guilty about leaving behind loved ones and being unable to care for her parents at their end of their lives and providing for her siblings. My dad on the other hand, felt like he had nothing left in Vietnam. At the time, he was the last of six children still remaining in Vietnam. His siblings and parents were already in the United States but my dad stayed behind to pursue priesthood. However as the Vietnam War progressed and Communism grew in power, my dad knew that he could not stay. My dad can’t recall how many times he attempted to escape because he had tried so many times. He persevered because all he wanted was to see his mother one last time and he would die trying if he had to. When he finally succeeded, he was taught to steer the ship just in case something were to happen to the captain. My dad said that everyone on his boat got extremely seasick, but by the grace of God he did not and was able to get the boat safely to Thailand. My first trip to Vietnam, 1996. We know that you work at the ACLU of Oregon. Was that decision inspired by your your legacy as the child of refugees? My dad’s journey of fleeing his home in order to have the freedom to practice his religion and maintain other values such as free speech echoes a lot of what’s currently happening in our national landscape. I often wonder if my parents were fleeing Vietnam today, how different of a situation it would be. Would they even be able to come to the United States? Would they be rejected over more educated and skilled people from countries like Norway? Would they have had a path to citizenship? I know my parents shed aspects of their identities when they arrived in the United States in order to assimilate. But would they have received even more judgement and hate that refugees are impacted by today? My dad is the reason why I work at the ACLU of Oregon. My dad as a boat person endured an unbelievable journey to be here today, and his story inspires and gives me the strength and motivation to overcome adversity. I started at the ACLU the summer before the 2016 Election. I was just so excited to be working somewhere that is committed to defending and advancing immigrants’ rights. I had no idea what was in store and how critical the role of the ACLU would become. So many of our civil rights and civil liberties have been under attack by the Trump Administration and it’s absolutely terrifying. Oftentimes it feels like history is repeating itself. But then, victories such as how the ACLU leaped into action after the Muslim Ban gives me hope and inspiration. As a child of refugees, it is an honor to work at the ACLU of Oregon where I can help protect others civil rights and civil liberties in such turbulent times. My mom and I after her Naturalization Ceremony, 1997. Is there such a thing as the typical “Southeast Asian American experience?” Are there any stereotypes you have heard or have had to face being Southeast Asian/Asian American? There is no such thing as the “Southeast Asian American experience”; the Southeast Asian diaspora has culminated in so many different and inspiring stories. Sure, stories have common elements like resilience and sacrifice. That said, even though I’ve used the word “resilience” a few times now, it also drives me nuts. I feel like because we are thought of as resilient, we are forced to be resilient in every situation and context moving forward. This feeds into the Model Minority Myth, which is stereotypical and harmful to not just Asian people, but also to other minorities who have endured just as much oppression, if not more. The Myth perpetuates racism by pitting Asians against other minorities. It is a cop out and inhumanely puts a value on people based on their race. I have grown up with the expectation to be pretty, perfect, smart, and most importantly, silent. The Model Minority Myth has forced me into a tight and suffocating box. Even though I am aware of this, it was so ingrained in me that I am still struggling to break out. This is why I am so thankful and appreciative of Project Yellow Dress. What was it like for you growing up Southeast Asian American? In what ways do your parents or your culture shape your identity? My parents raised me to be invisible. I was sheltered from extracurricular activities, partially because they were cost-prohibitive, but also because they wanted me to focus on academics. My parents wanted me to just fly under the radar and stay out of trouble. So I did. I was quiet and introverted. I would never raise my hand in class and would struggle to participate in conversations. Naturally I gravitated toward friends who also flew under the radar and unsurprisingly, they were also Asian American. While my life at school was uneventful, home life was always vibrant. We lived close to my dad’s family and we were always together. Although it was never quiet, I was privileged to be supported by such a loving family and to always be fed with the best homemade Vietnamese food. 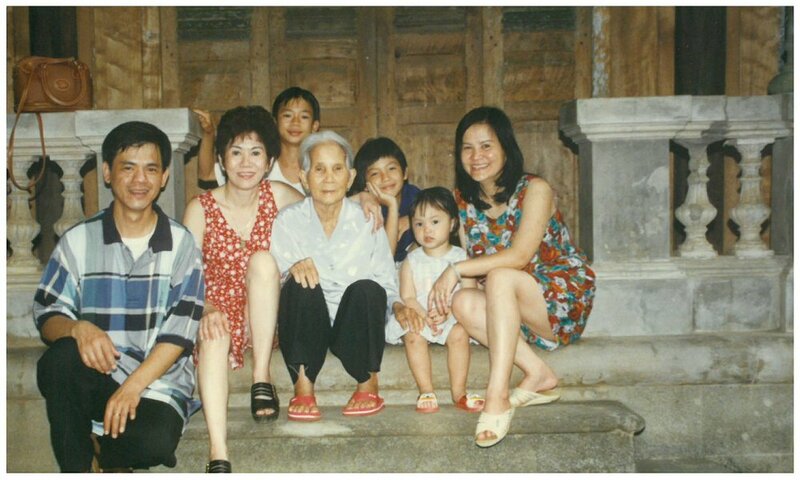 My family celebrating Tết, 2005. Reflecting on how my parents raised me, I feel like they were very strategic. They didn’t buy cable TV because it was costly, but it forced me to watch Asian entertainment with them and so I have Asian soap operas to thank for my language fluency. I also went to a Vietnamese Catholic school for eight hours on Sundays for six years. There I was forced to participate in dances, festivals, fashion shows, and plays that felt ridiculous at the time, but also allowed me to participate in and learn about my culture. What languages do you speak or understand? Can you read or write in these languages? Is there a language barrier issue within your family? Vietnamese was my first and only language until Kindergarten. My parents knew that as a young student, I would pick up on English quickly so they only communicated with me in Vietnamese. I remember being very resentful of this because I felt totally left out and alienated by my peers. But they were right, I figured it out quickly and now I can easily communicate in Vietnamese as well as in English. I also can write our Christmas cards in Vietnamese to relatives, which is a fun perk for my parents. I think my parents can speak English well. However, I’ve heard from friends that it can be hard to understand my parents. I really think it’s because they get so nervous and self conscious that they stumble over their words. I take care of a lot of technical things like medical and insurance stuff - not because my parents are incompetent, but because it takes a less effort for me to do it than it does my parents. Plus, it’s truly the least I could do. Was there ever a moment when you felt extremely ashamed or extremely proud to be Southeast Asian? I think many people can relate to or have a mortifying food story. Once in elementary school, my mom made and packed me a noodle dish for lunch. And I was accused of eating smelly worms by my peers. I am willing to bet that most of those kids who ridiculed me will now pay an absurd amount of money to Instagram and eat the same dish in some gentrified, hipster, probably appropriated, restaurant. The irony kills me. What are your thoughts on the lack of Asian American/Southeast Asian American/Ethnic Studies in most schools? Did you ever personally learn about Vietnamese Boat People in your history classes? In elementary school, they taught us how to eat with chopsticks. In high school, I recall briefly learning about the Vietnam War and watching "Forest Gump." Does that count? I think this is one way our education system contributes to institutional racism - we spend years studying European and American history but not about other cultures which are just as rich. There are a lot of issues in the Asian and Southeast Asian communities that are considered a bit taboo to discuss, such as mental health, domestic violence, sexuality, abortion, and even politics. Have you ever been part of conversations or instances involving these or other issues? What steps can we take to help remove some of the stigma from these issues? My family is extremely conservative, but I am not, and we all know it. However, instead of confronting our differences and engaging in dialogue, we tend to choose to pretend they don’t exist. Growing up, I avoided those topics because they felt uncomfortable. However, since working at the ACLU of Oregon, I realized that we cannot be silent and have felt more compelled to walk the talk. Although I have yet to have a substantial conversation with my family about any of these “taboo” topics, I have tried to initiate conversations when I hear disparaging quips about other cultures or commentary on the “good immigrant versus bad immigrant” conversation. I usually feel discouraged by my parents’ stubbornness and irrationality because of how quickly the conversation is shut down. Although it oftentimes feels hopeless, I feel it’s important for folks to be persistent. If we don’t try to break down these stigmas within our own family, who will? Mainstream media has often been criticized for its lack of or trivialized portrayal of Asians and Asian Americans. What do you think? Who was the first Asian or Asian American actor or media personality you remember seeing on TV or in the movies? I am very enthusiastic about seeing Asian Americans featured anywhere! On the big screen, sports, but also in the kitchen! I am a big fan of Andrea Nguyen and Jet Tila. Although I have experienced traumatic times in which I was heckled for my lunches, I am excited that Vietnamese food is getting the culinary appreciation it deserves. It makes me even happier when Asian chefs are recognized and are helping folks experience and enjoy our food in authentic and accessible ways. “Worms” no more! Jackie Chan is the first Asian American actor who I can recall. Thankfully, now I can name several Asian American actors, but the list is still minimal. Perhaps the fight to stop whitewashing and casting white people to portray people of color will help. In addition, the portrayal of Asian people in movies are usually based on offensive tropes, such as how Asian men are frequently emasculated. I don’t feel too optimistic in this arena, especially not while movies like The Great Wall featuring a white savior are being produced and widely viewed.